Bristol’s accomplished chamber choir makes its Cornish debut singing a concert in the 15th century parish of St Mabyn near Bodmin with a programme of choral music to suit all tastes. The concert includes music by Tallis, Purcell, Rachmaninoff, Stanford, Finzi, Holst, Vaughan Williams, Tavener, MacMillan, Lauridsen, Whitacre and Esenvalds along with some madrigals and folk songs. Just perfect for a Spring evening. 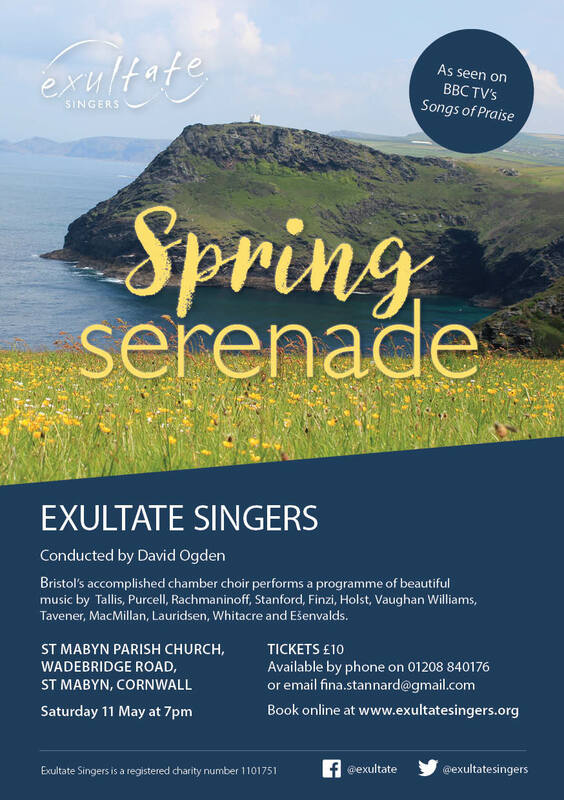 Telephone Fina Stannard on 01208 840176, email fina.stannard@gmail.com or book online at the Exultate Singers' shop.